The British Orthodox Parish of Christ the Saviour at Winton, Bournemouth, celebrated the church’s Diamond Jubilee with a visit from Abba Seraphim combining services and events over the weekend of 2-3 July. Although the parish was founded 75 years ago, the church – formerly a stable and carpenter’s workshop – was not purchased and converted until 1951. The celebrations began at the Church with Midday prayer and an address by Father Gregory Tillett on “The Year of Jubilee” and Abba Seraphim spoke about some of the witness and contribution made by departed church members, especially the faithful women of the church. This was followed by a Reception and Buffet lunch in the Lounge of nearby St. Alban’s Church, Charminster. Among those attending were Fr. Robin Nash, parish priest of St. Albans and Father Marcus Brisley, parish priest of the Catholic Church of the Annunciation, Charminster. Also present were Councillor Beryl Baxter (Mayor of Bournemouth 2009-2010) and her husband, who live next to the Orthodox Church. Visiting BOC clergy included Fathers Sergius Scott and Seraphim Mina from London. After lunch Fr. Gregory gave a talk, “The Mission to the Ninevites: Universal Orthodoxy in the West”, which was followed by a lively discussion. At 4.30 p.m. Abba Seraphim led a good number of clergy and people in prayers for past members and clergy of the church at the Wimborne Road Cemetery and flowers were placed on the graves of Archdeacon James Goddard, Flora Peckham, Father Stephen Hatherly and Martha Coppin. Evening Incense was raised at the Church and a Celebration Dinner was held at Bates Restaurant in Charminster. 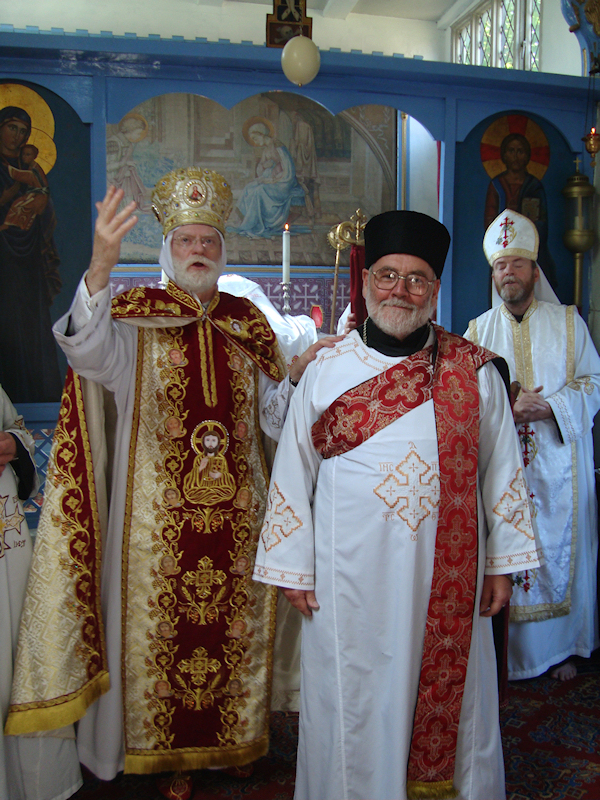 On Sunday morning Abba Seraphim celebrated the Divine Liturgy at the Church and Fr. Simon preached the homily, weaving together the themes of the various lessons to emphasise the importance of fidelity. During the Liturgy Abba Seraphim ordained Readers Nicolae Popa, John Morgan and Edward Smyth as subdeacons, the first two to serve at Bournemouth, the third at Portsmouth and Bournemouth. Subdeacon Christopher Barnes was ordained as a deacon to serve the Babingley Parish and Father Gregory Tillett, who is attached to the Bournemouth Church when in the United Kingdom, was elevated to the order of hegoumenos.